James “Whitey” Bulger’s brother, William Bulger, left the church after the service. For many years, Jean Bulger urged her wayward son to find his way back to St. Monica’s Church, just around the corner from their apartment on Logan Way in a South Boston housing project. Some three-quarters of a century later, James “Whitey” Bulger finally made it back, in a casket, for his funeral. Bulger, Boston’s most notorious gangster, who was serving a life sentence for 11 murders, was beaten to death by other inmates at a prison in West Virginia Oct. 30. Keeping with wishes shared by the Archdiocese of Boston and Bulger’s survivors, the funeral Thursday morning was private and confined to immediate family and a few close friends, about 30 people in all, including the twin sister of Bulger’s longtime girlfriend, Catherine Greig, who spent 16 years on the run with him. Hank Brennan, one of Bulger’s lawyers, also attended. The 89-year-old James “Whitey” Bulger was killed by fellow inmates last week. 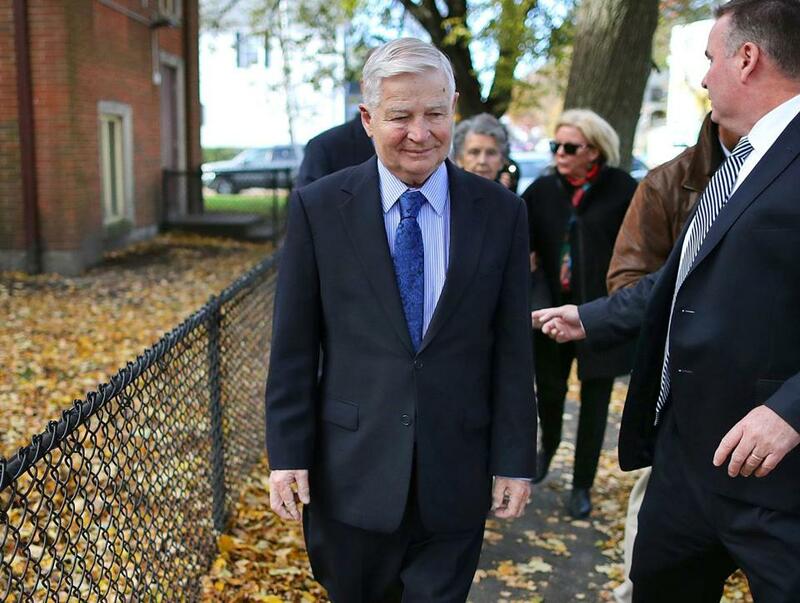 Bulger’s brother William, the former president of the Massachusetts Senate and the University of Massachusetts, left the church with his wife, Mary, and their sons and daughters. 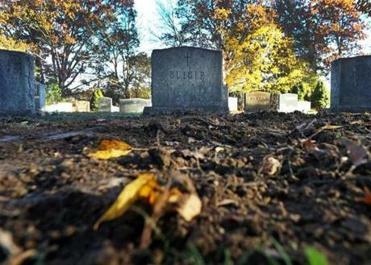 Bulger’s brother John left by another door. Reporters pursued Flavin down Devine Way, past a nondescript building that houses the Gavin Foundation’s recovery center, where those addicted to the kinds of drugs that Whitey Bulger once flooded his neighborhood with seek help. A woman hung out one of the windows of a nearby building and took pity on Flavin. “Run, priest, run!” she shouted. In an interview after the funeral, Flavin said that he offered the Mass at the request of the Bulger family and that it was meant to bring peace to both Bulger’s family and his victims. “We did it as quietly and as respectfully as possible,” he said. Because he had to catch a flight, another priest assigned to St. Monica’s, the Rev. Peter DeFazio, presided over brief graveside prayers at St. Joseph’s Cemetery in West Roxbury, where Bulger was buried alongside his parents. While there was no formal procession to the funeral, about a half-dozen cars brought mourners to the graveside. In letters sent from prison, Bulger made it clear that his final wishes were to be buried next to Greig, who took care of him all those years they spent in a rent-controlled apartment in Santa Monica, Calif., the city named after the saint for whom his childhood parish is named. She is 67 and is scheduled to be released from prison in 2020 after serving a nine-year sentence for helping him evade capture and refusing to testify against him. Having ignored his mother’s entreaties to get back to the church that had been a focal point of the family’s religious and social life, Bulger found what he called the best years of his life with Greig in the city named after the patron saint of difficult children. Beyond that old irony was a more current one, of Bulger’s family gathering to mourn a loved one who died at the hands of someone ultimately under the control of the federal government. In life, Bulger killed with impunity because, and sometimes with the assistance, of the FBI, for whom he was an informant. He died at the hands of fellow inmates who beat him to death after his medical status was suddenly and inexplicably changed by the US Bureau of Prisons to allow his transfer from a prison in Florida where he was safe to a prison in West Virginia teeming with organized crime figures from his native Massachusetts. “Our family and a lot of families have had to live with that feeling a long, long time,” said Tom Donahue, whose father, Michael, a truck driver, was murdered by Bulger. Like most people, Donahue only learned of the funeral after it happened. Greig’s sister, Margaret McCusker, said she appreciated that the family invited her to the funeral. Her sister was not allowed to leave prison in Minnesota. The neighborhood in and around the Mary Ellen McCormack housing project has changed dramatically in the years since Bulger roamed its streets. Once overwhelmingly white and Irish, it is now a community of various colors, ethnicities, and cultures. Bulger used to volunteer to carry the groceries of the old women and housewives in the project, or pull over when he saw them trudging back from the stores on Broadway, offering them a lift. But those stories, like the old women who told them, are long gone. Not long after the Mass had ended, an elderly Asian woman using a walker made her way gingerly across Logan Way, mounting the sidewalk outside the squat brick building where Bulger lived as a boy, where he kept an ocelot named Lancelot, where his mother worried for him, and where he had a chance to do anything he chose before he chose a life of crime. The old woman shook her head when asked about Bulger’s funeral. Before he left the pulpit, Flavin spoke the words of Jesus on the cross, a fitting coda to a painful chapter in the life of the city and its most notorious resident. “It is finished,” he said. Kevin Cullen can be reached at cullen@globe.com. Emily Sweeney can be reached at emily.sweeney@globe.com. Shelley Murphy can be reached at shelley.murphy@globe.com.